The Electoral Registration Officer for Ashford has sent an annual enquiry to the addresses of all registered voters in Ashford. If you do not respond members of your household will be removed from the Electoral Register, so you will not be able to vote in future elections, and you could be fined £1000. Many organisations rely on your being on the Electoral Register as evidence of your identity. In one example a family were not permitted to stay in planned holiday accommodation because they were not on the Electoral Register. 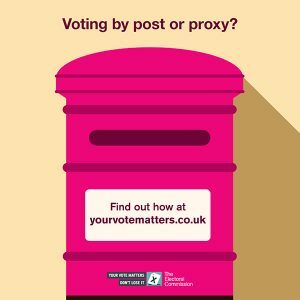 If you do not receive an Annual Enquiry Form or have any questions about Electoral Registration you can contact Electoral Services on 01233 330402. Please note Electoral Services will not discuss your registration with anyone else including family members. The Local Government Boundary Commission for England (LGBCE) have published their Final Recommendations for ward boundaries for Ashford Borough Council (ABC). The arrangement, fails to address the issues created by the shape of Victoria Ward and creates a worse situation than the existing boundaries. There is a now a smaller area of Watercress with only tenuous links to the remainder of the ward and a larger area north of the railway line, which as well as the Town Centre includes the new Crescent West development, Godinton Road and adjacent streets and the whole of Cobbs Wood industrial estate. 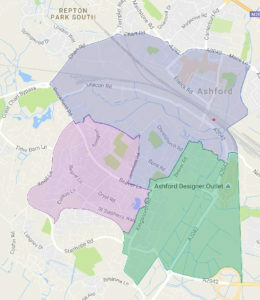 South Ashford Community Forum had put forward proposals for more compact, separate wards for South Ashford and Ashford Town Centre but LGBCE have adopted the arrangement originally proposed by ABC. We noticed a number of comments on social media regarding the lack of information relating to the candidates for the recent Kent County Council Election. We have asked all of the parties fielding candidates for the Ashford Constituency for the General Election and the Ashford Borough Council By-election for the Victoria Ward to provide us with pdf copies of their campaign leaflets. Those that have been provided can be viewed from the links below. Neither South Ashford Community Forum nor the South Ashford website supports any of the candidates nor their parties for either election, nor do we accept any responsibility for, nor necessarily agree with, the information provided by the candidates. As we do not want this website used for political debate, comments are disabled on this post. you must be registered by 11:59pm tonight. You will need to provide your national insurance number to register. This can be found on your national insurance card if you have one, or on paperwork such as your payslip, letters about benefits, tax credits and some pension documents. Please make sure you enter it correctly as it will be checked before you can be registered. If you do not have a national insurance number you can still use the website to make an application but it will ask you to give a reason and you may be contacted for more details. It is not possible to check online whether or not you are already registered. You can contact Electoral Services on 01233 330402 if you want to discuss any issues around your registration or call into our offices to view the current electoral register. Please note Electoral Services will not discuss your registration with anyone else including family members.